After being home from Paris for a little over a month, I’ve obviously been thinking about that marvelous city for a majority of my free time. I’m missing it more and more each day so I’ve decided that it’s finally time to now start posting my tips, useful facts and just favorite things about the city for others who might be traveling there soon, who might want to go one day or those who might just have a general inkling to know more about my time over there. While living there, I compiled a list of tips and useful things I feel that people will be able benefit from that are drawn from my own experiences and adventures over there. One of my tip lists I want to share with the world is what happens when you take five days of your life to explore every inch and secret room within Paris’ famed Louvre museum. Exploring the whole Louvre was one of my top Paris Bucket List items and I accomplished it the week before leaving the city. I hope that my experience within the museum can help out anyone else wanting to explore it.. So without further ado, here we go! 1. No matter what you’ve heard about the gigantic size of the Louvre, it’s bigger than you ever could have imagined. Standing outside the enormous palace, the size is intimidating. You’re thinking to yourself, “There’s no way I’ll ever actually see this whole thing.” You’re scared to even walk in, knowing how overwhelmed you’ll become within seconds. Yet, knowing all of this, you slowly descend the steps into the “secret” entrance of the Louvre. Immediately, the crowds overcome you and you’re lost within a sea of tourists, unable to even move. As they all shuffle through the short line into the underground entrance, you push past and finally break free of the camera flashes and jumbled combination of four different languages being screeched around you. You’re finally in. You’ve come through the carousel entrance, you’ve shoved past the crowds and you’ve finally made it inside the Louvre. You stand gazing at the three different museum entrance choices before you: Richelieu, Denon and Sully. Without thinking, you choose one and venture up the escalator inside. Map in hand, you clutch it tighter than your purse, knowing that this little paper map is your lifeline to the fantastical history that lies in waiting for you to discover. Slowly, you calm down knowing that you’ve made it inside and that you’re now exploring one of the largest collections of history in the world. You ease into yourself and get lost within the beauty that is the Louvre. Though it’s massive, each room is full of something new and the little map you’re clutching saves you from terror. After about two hours of exploring, you’ve finally conquered the first of three sections in the museum. You feel accomplished and ready to do anything. You know you’re a master Louvre patron already. One section down, two more to go! ..four days later, you’ve done it all. You’ve seen all three sections. You’ve battled thousands of tourists. You’ve won. You’ve seen the entire Louvre after five days of exploration. And it was glorious. The size was no match for your passion of art and you leave for the last time feeling a lightness and renewed passion for life. You have seen the entirety of Paris’ Louvre museum. This is what I went through each day I dared to go back and see more. It took me five days, but by jove, I did it! 2. Napoleon was a bigger jerk than the world leads you to believe. You all know Napoleon, right? The guy who tried to conquer the world and actually did conquer many parts of Europe? 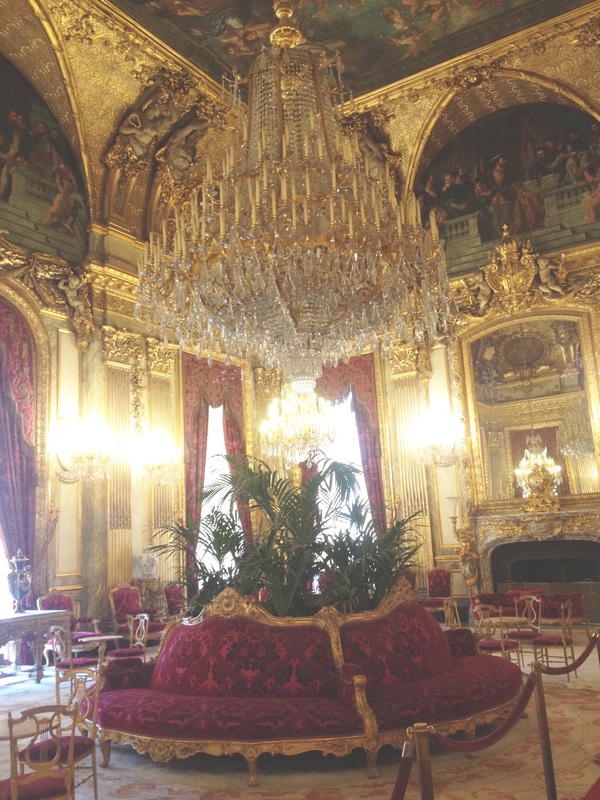 Well anyway, at one point in history, Napoleon lived within the Louvre and his apartments within the palace are still present and perfectly preserved today. You can explore the entirety of them within the Richelieu section of the Louvre and they’re magnificent. Plush oversized furniture covers the floor below an enormous, elaborate diamond chandelier that hovers above the main living room; extravagant bedrooms flowing with diamonds and decorated with uncomfortable, yet gorgeous furniture. 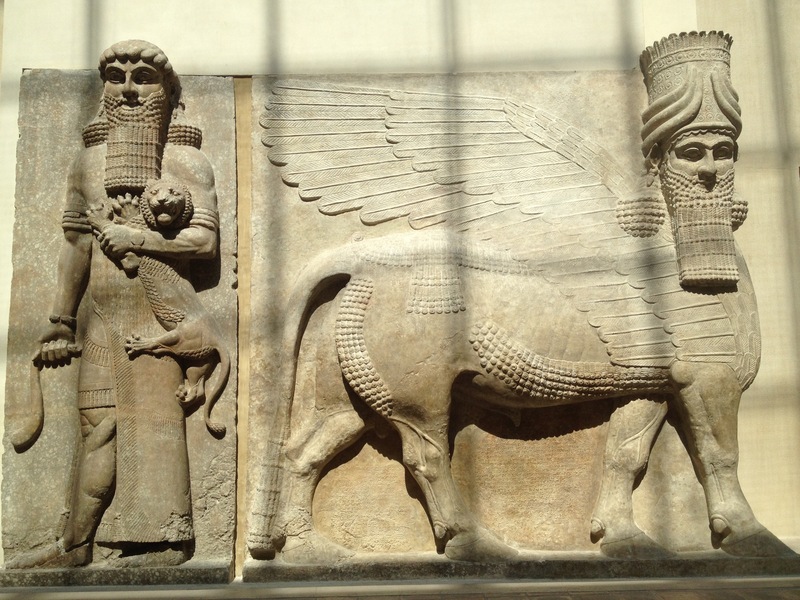 I’m telling you, this part of the Louvre will blow your mind. It’s phenomenally overdone and elaborate in ways that I never could have imagined possible in real life. It was extraordinary. But obviously, Napoleon was more full of himself than anyone could have imagined.. Or at least than I could have imagined. 3. The Egyptian section is one of immense magnitude and indescribable history. Oh, the Egyptian section! Gah, it was marvelous. I’m so excited right now even just thinking about it again and writing about it. Okay, so I have to start off with telling you that all my life, I’ve wanted to visit Egypt. When I was in 6th grade, I did a school project on Nefertiti.. I regularly watched The Mummy movies.. To say I was obsessed with Egyptian culture and history is probably an understatement. So, getting to see a full collection of Egypt’s ancient history was of great excitement for me. This section houses many, many sarcophagus’ and ancient tablets depicting everything from royal day-to-day activities to farm life. The Louvre even holds the sarcophagus of Rameses III, pharaoh of Egypt from 1186 – 1155 BC. The inscriptions on each tablet were mesmerizing and the sarcophagus’ were marvelous.. 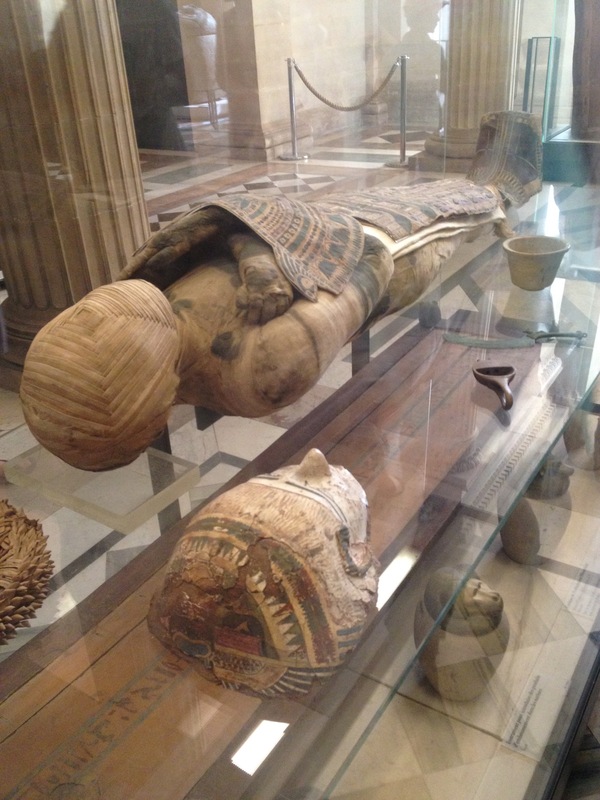 But none of it compared to the fact that I saw a real life mummy. WHAT! Yes, a real life mummy in a glass case on display for everyone to see. 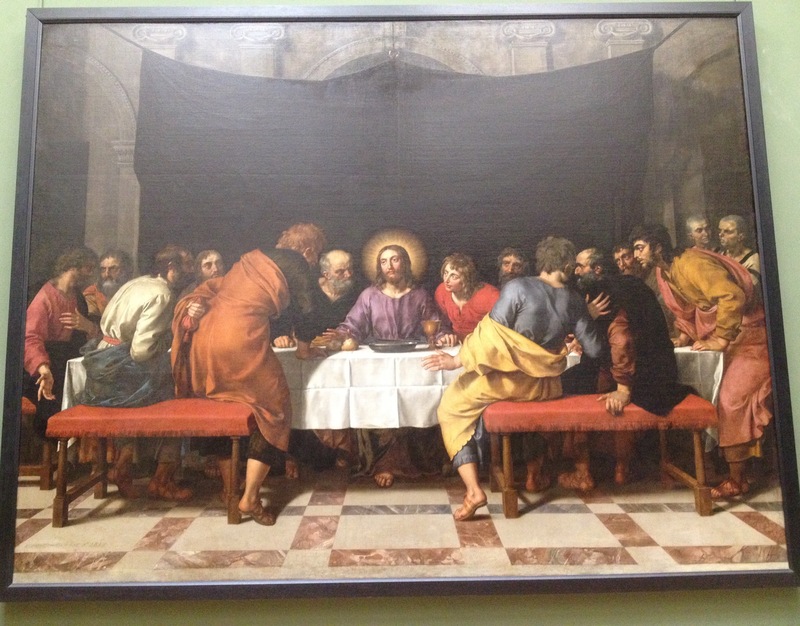 It was indisputably the most amazing thing in the Louvre for me. Complete with jars on the sides full of the organs from the deceased (just like I learned about from the Mummy movies! ), the mummy was truly humbling for me. I can’t quite describe why I have such a fascination with ancient Egypt (it could have something to do with adventure – because I’d go ahead and be so bold as to say that I have a bit of a passion for it) but I can tell you that 6th-grade-Nefertiti-project-wielding Megan would have cried her eyes out and fainted at knowing that present day Megan had the privilege of viewing a real life actual ancient mummy in Paris. Man, sometimes I just have to re-read sentences like that that I type out and breathe, still unable to comprehend some of the things I’ve been blessed to do in my life. 6th grade Megan certainly never would have guessed I’d do most of the things I’ve been able to do thus far in my life. 4. “Dead ends” due to construction or other mishaps are not definite; there’s always a secret way to get to the section you need to see. During the five days it took me to explore the Louvre, I was turned away from multiple sections due to construction closings on staircases and hallways, yet wasn’t deterred. I was on a mission that I needed to accomplish and I wasn’t going to let a little hallway construction stop me from doing what I needed to do. Again, handy little paper map in hand, I studied the layout of the museum multiple times and always found smaller, hidden staircases or passageways still accessible to get me where I needed to go. So, if you are turned away for these reasons, fret not! If you’re determined enough and sneaky enough to search out these smaller, lesser known entryways, you can see everything you need to see. However, that being said, if there are certain entire sections closed off for things like this or art restoration, there is actually no way around it. This was something I encountered on the 2nd floor of the Denon section. The entire top level of this section was closed off for restoration and I’m sorry to say that that is final. Though you can find ways around closed off staircases and such, you certainly can’t sneak into places and do anything illegal. So, don’t take this advice as me telling you to pull off some sort of National Treasure stunt! Nic Cage won’t help you out if you decide to break laws. 5. The provided maps are actual lifesavers and your connection to the museum world. As I’ve mentioned in almost the entirety of this post, the Louvre provides handy dandy paper maps in every language for you to use to your advantage while exploring the Louvre. The maps contain a floor plan of the museum complete with color coded sections and suggestions on what is most famous in that section and on that floor. They seriously are so helpful if you’re wanting to find a way to conquer the Louvre like I did or if you’re just wanting to find the Mona Lisa. Make sure to grab one as you pass by the information center, I promise you won’t regret it. *Bonus* There is a “secret” entrance as mentioned above that allows you to skip the crowds and get inside within seconds. This little tidbit of information that I possessed as a Parisian is probably the thing that my Dad was most thankful for when he and my Mom came to visit. As you can imagine, the Louvre is almost always stuffed full of humans and if you can believe it, my Dad is not a big crowd person. I know I love new things and meeting gaggles of new people, but I certainly didn’t get that from my Dad because he’s the exact opposite. If he could avoid all human contact outside of those he loves, I think he’d live his happiest life. So, for him, coming to Paris was a definite culture shock in the way of people. He previously thought that a crowd was the ironic wave of people leaving a Royals game early during the 8th inning to avoid everyone else, all the while ensuring their inevitable encounter with all other patrons from the game. Paris is definitely not the ironic wave of people from a Royals game. I’m pretty sure my poor Dad was in a state of shock and anxiety the whole time we were in the city and the Louvre was no exception. Though I couldn’t disperse the crowds within the museum for him, I could ensure that Dad didn’t have a heart attack while just entering it. The “secret” entrance is called the carousel and is a side staircase behind the pyramid that leads to the shopping center and also the entrance to the museum itself. It’s highly less frequented than the main entrance and a nice welcome for the father of a daughter who loves the city but appreciates her dad’s hatred of people.. Love you, Dad! So, there you have it! Just a few tidbits and facts that I can provide for you beautiful readers and fellow adventurers who hope to some day visit the Louvre for the first time or maybe return for another visit. I hope I was helpful! There’s certainly so much more to learn about this fantastical place though, so if you have any questions or comments for me, don’t hesitate to ask! As you can tell, I obviously miss Paris with a burning passion and would love to talk about it even more.